With the spring season rolling in, going out to eat is a much more inviting prospect. For anyone looking for a good time all around, Governor’s Quarters, located in Bay City, covers all the bases. “We are Bay City’s only basement bar and original taproom,” says manager Jeff Owczarzak. Since it was bought out by new management, the place has become a bar and grill with an inviting atmosphere that highlights its clean beer. Customers can also look forward to a constantly changing selection. The 30 beer taps available rotate regularly through different beers. Typical drinks like assortments of canned beers, or Busch Light won’t be sold. “We don’t sell the stuff that every other bar in Bay City sells — not because it’s bad, but because we find something better,” said Owczarzak. Though Governor’s Quarters isn’t just one big beer tap, the establishment also features a full menu of varied foods including sandwiches, quesadillas, burgers and wings, all filled with their own delectable taste. Many items take to the namesake of the bar and grill, such as the “speaker of the house” sandwich or the “liberty bell” chicken breast. Appetizers come with their own personal touch, with homemade french onion dip and chips served with several of the meals. Governor’s Quarters tops their services off with the atmosphere and entertainment. All the tables are mixed in with intricate furniture decorations, such as the two lavish pianos lining the west walls, beer logos and neon signs lighting up the walls, and even the bar counter has a slew of art painted into it. Nothing is plain or dull, especially the lighting, which is just bright enough to make everything visible while still making it feel like a nightlife destination. No part of the bar and grill is similar to the other. Entertainment is another area where customers have a wide selection to choose from. The most prolific of Governor’s Quarters events are their trivia nights, which have been going strong for three years. One example is vinyl trivia night, in which customers can take guesses from a profile of records to test their knowledge of music. 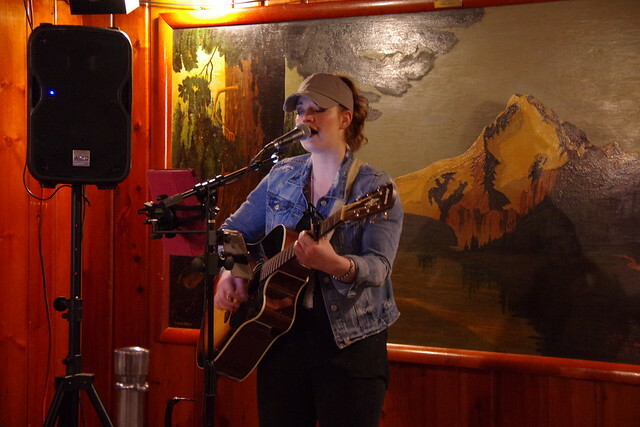 The songs don’t stop there, though, with live music at “acoustic nights” on Thursdays. Local artists come to perform, with a part of the bar laid out just for them: an open corner stage. Governor’s Quarters will be partnering with Electric Kitsch for Record Store Day April 13. Owczarzak states that Dogfish Head Brewery will brew a special craft beer called “American Beauty” for the event. For those wishing to come for more private occasions, the back room and Arbeitoer Hall located above the bar are available for anyone to rent out, whether it be for a party, meeting, wedding reception, graduation party or birthday. Governor’s Quarters strives to answer one of the most important questions for any business: what makes them unique, and why should people go to Governor’s Quarters instead of any other bar and grill or restaurant? Since their founding, they’ve been consistently answering that question with bravado, giving Bay City residents a nightlife worth driving down for. For more information on Governor’s Quarters, such as menu items or reservations, go to governorsquarters.beer (yes, this is their real address) or check out their Facebook page.